Although there was no body, on November 23, 2008, Richard James Edwards was officially presumed dead, over thirteen years after his last known appearance. As a member of the glam-punk rock ’n’ roll Welsh band, the Manic Street Preachers, Richey Edwards, a longtime friend (and initial roadie of the group), quickly became the band’s principal lyricist and designer of album covers. By all accounts, he wasn’t much of a musician, miming his rhythm guitar parts in early performances, roughly playing the six-stringed instrument in others. It was words and the truth that words could convey that drew on the talent and imagination of the man. As a voracious reader, you can find Richey-pulled quotations from some of his favourite writers all over the band’s early record and single covers. 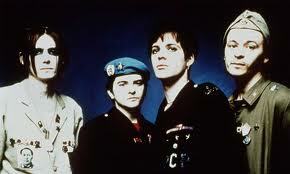 A quote from Karl Marx: “I am nothing and should be everything” inscribes the Manic Street Preachers first release, the New Art Riot E.P. (1990) while the entire Song Of Those Who Died In Vain, a poem by Primo Levi, a favourite of Edwards, graces the back of the album cover of Gold Against The Soul (1993), the band’s second full-length release. But it was early on that worrying signs of depression showed up in Edwards’ life. I remember, sometime in the summer of 1991, shortly after I had discovered the band via a high school friend lending me an early single, that Richey Edwards made waves in the New Music Express, Britain’s premiere music magazine. Leafing over a newsprint page, I saw the now-famous photograph of the young British rock star: post concert, in DIY-designed, glam-styled, baggy lavender shirt (“Spectator of Suicide” written in bold typeface across the front) and matching cravat, his left sleeve pulled up and his blood staining the length of his arm. Edwards had argued with a reporter about the band’s perceived authenticity, taking a razor blade and carving “4 Real” deeply into his own arm. It was an important, defining moment for Edwards and the band, for sure, but not the decision of a sure mind. I decided against placing the picture here, in this article, but go ahead and Google it. You’ll see. There is far too much “real” in self-abuse. The lyrics are distinct, pointed and harrowing – an endeavour inherent in much of Richey Edwards’ work. Soon after the release of The Holy Bible, Edwards checked himself into the Priory psychiatric hospital in an effort to deal with his various afflictions. Unfortunately, even though he’d be released, those various illnesses would get the better of him. Now rock and roll legend mixed with conjecture, on February 1, 1995, on the eve of a US promotional tour for the Manic Street Preachers most recent album, Richey Edwards disappeared. For the previous two weeks, he had been withdrawing 200 pounds a day from his bank account. He checked out of the Embassy Hotel in London at seven in the morning and drove to his apartment in Cardiff, Wales. He was spotted at both the Newport passport office and bus station shortly thereafter. A taxi driver supposedly picked up Edwards and drove him past the writer’s childhood home, dropping him off at the Severn View service station, close by the Severn Bridge, a renowned suicide location. It’s widely believed that Richey Edwards took his own life by jumping from that bridge. His abandoned car, lived in and ticketed, was found at the service station. His body, to this date, has never been found. At the time, as a fan of the band and an admirer of Edwards’ writing, I remember listening to that Manic Street Preachers album intertwined with a sense of admiration and the surreal. It was as if the writer had put everything he had to offer into The Holy Bible, that the ongoing search for the perfect word and lyric had finally been attained and, having done so, the man had nothing left to give. Over the years, many books, both fiction and non-fiction, have been written about Richard Edwards and his legacy has gone on to influence many other musicians, artists and writers. In over two decades since his disappearance, with purported sightings in such far-flung locales as Goa, India as well as the Canary Islands, Edwards has never been far from the mindset of the people that he touched. 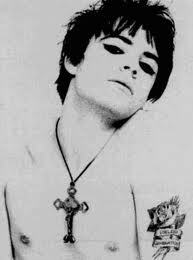 In an existential truth, Richey Edwards never really disappeared. His body, his madness and, most importantly, his truth, is found today in print, in sound, in minds and in hearts the world over. His life, in sickness and beauty, is the flawless lyric that the poet so fervently sought. Previous Post Previous post:March Madness Begins Here – Alice Cooper, Arkham Asylum And More! Thank you for this. It’s so good to see Richey still being remembered 17 years after his disappearance. I’m currently reading the book by Rob Jovanovic – am fascinated by his story. Your last line sums things up beautifully. He was a poet of the highest order. His words startle and stun. Strangely, today is Self-Harm Awareness day. I’m wearing an orange bracelet in his memory. Thanks for your comments Andrea. We’ve got five albums worth of words from Richey. He definitely made a great literary and artistic contribution in a short amount of time and should be remembered accordingly. Off to listen to Journal for Plague Lovers, again, now!